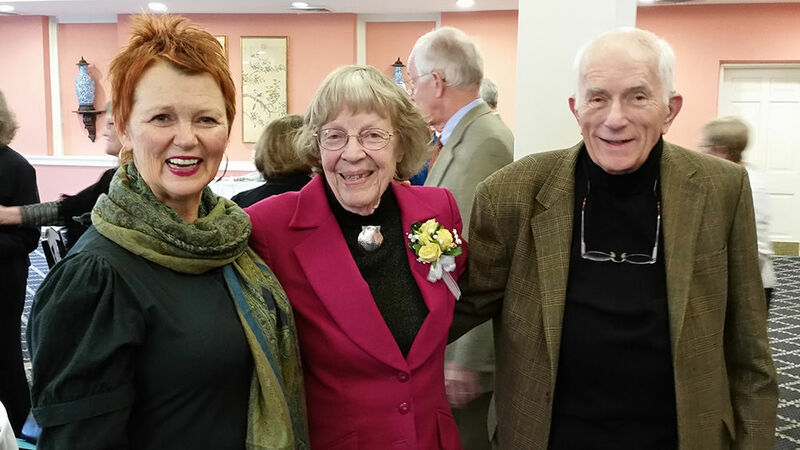 Margaret Mueller, Professor Emerita of Salem College, celebrated her ninetieth birthday on campus with friends from the Salem College School of Music in early December. Mueller and her husband, renowned organist and professor, John Mueller, joined the Salem College faculty in 1958, after receiving degrees from Oberlin College Conservatory of Music. She taught organ and theory from 1958-1995 and continued to teach at the Salem College Community Music School until 2007. In 2001, she retired from St. Paul’s Episcopal Church in Winston-Salem, where she was organist for thirty-eight years. The Muellers are both Fulbright Grant recipients, which Margaret used to study with Helmut Walcha in Germany, and an Aeolian Grant from Oberlin allowed her to study in France with André Marchal. Mrs. Mueller has performed extensively as a soloist in the United States and Europe; heavily influencing the Baroque organ movement in America, including the installation of many Flentrop organs. Mueller and her husband also founded the Salem College and North Carolina School of the Arts Summer Organ Academy, which they co-directed for twenty-one years. Their legacy continues at Salem, as students today still practice on Salem College’s 1965 Flentrop Organ in Shirley Recital Hall at the Elberson Fine Arts Center.